Case: An EBE is found on a mountain in a block of ice. Destination: Canada, Virginia, Washington D.C.
'Gethsemane' is really dark. I mean that literally. Even, inexplicably, the FBI panel Scully appears before. There is so much interplay between light and shadow, it's practically, visually, a 1940s noir. Given the mythology at this point in the series, there's something cheeky in that as the term noir was applied to cinema that conveyed a philosophical irony. And it is ironic that in order to secure a TV series longterm, it's forced into a formula that begins and ends with "nothing can ever change here," though this is less true these days. It's completely incongruous that a 'successful' TV show doesn't allow its characters to change their core beliefs for any reason. Or, my favorite, that each successive season must end so suspenseful, despite the fact that nothing can really change, that the show itself, in this case, will just go ahead and change the tagline from "Trust No One" to "Believe the Lie." If that isn't Chris Carter and company bringing us in on this thing, I don't know what is. After this "Is Mulder dead?" cliffhanger, Chris Carter is either the most audacious or most oblivious person in TV land. (In either case it's a win/win because at the end of the day, they're both enviable.) But let's wind it back, in honor of the episode which, itself, starts in medias res. Firstly, I am a total sucker for any episode of The X-Files where Scully or Mulder must visit multiple outside experts to learn about a piece of evidence they have but don't fully understand. This happens all over the place in 'Gethsemane.' (My favorite being the scientist Scully visits who's analyzed the ice core samples because, really, where else on TV would you ever hear the word chimera?) I'm equally a fool for when Mulder and Scully are onto something SO BIG and SO IMPORTANT that they must separate to cover more ground. Finally, I will fall every time for dialogue between these two that veers into that angsty 'I'm not really mad at you, nor do I actually mean any of the words coming out of my mouth but I don't have anyone else but you to act this way around, okay?' territory. 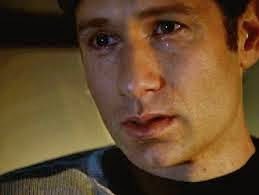 Luckily with the amount of drama this season finale is supposed to deliver, the Mulder snd Scully relationship malaise gets turned up to eleven. All kidding aside, this season ender might be the last episode to have any foothold in the previous mythology, even if said mythology is turned on its head, it's still rooted in what we've been told thus far. The narrative also lends itself to a far darker, more cynical belief system we will come to suspect very much involves our own nefarious government in ways we didn't dare to believe in previous seasons. (Even despite the select very corrupt antagonists we've come to know.) What Michael Kritschgau is offering Mulder and Scully as an explanation to 'alien life' on earth would involve so many people. But despite the drama and importance to the plot points (the end not withstanding), you can feel the show doing another lap around all of the themes they hold so dear. Scully's faith, Mulder's quest, the validity to what they're doing or why they should care – it all gets revisited and questioned and sussed out once again. So, maybe that TV formula this show was subject to held it together in some strange way, too. * I realized after re-watching 'Gethsemane' this time that I made the best kind of viewer for this show. I don't need to believe the lie because I ultimately didn't even care what the lie was. I can't honestly say that I would have loved the show any more than I do if the mythology stayed on track for nine seasons. What I loved about The X-Files (and still do) has never changed for me – it's Mulder and Scully, of course. * Bill Scully is a real cut-up. * The NASA symposium that bookends the episode is a nice touch. Mulder: "You think it's foolish?" Scully: "I have no opinion actually." Final Analysis: Believe the lie. I remember almost nothing about this episode except Gillian Anderson's performance, which was stunning. A good season ender because, as you say, although chances are overwhelming that Mulder is still alive, it raises the level of tension to an amazing degree. The scene between the two where Scully talks about her illness gets me every time. Mulder's face is hard to look at. Great review and I loved your comments about Chris Carter and television. It really is the characters that keep people committed to a show. Good writing is also essential but I agree with you, the mythology isn't what is important - its like the Walking Dead - I don't give a crap about the zombies, it's the people and their reactions/choices/relationships that intrigue me.